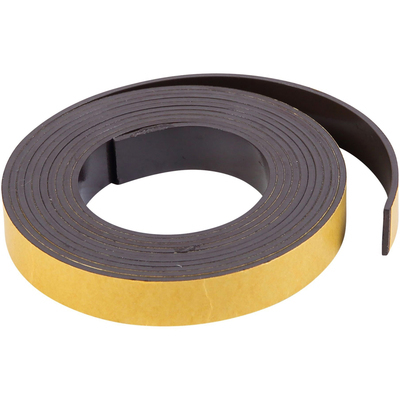 BVCFM2319 : MasterVision® Magnetic Adhesive Tape Roll, Black, 1/2" X 7 Ft.
Make building and maintaining your planning board easier. Use to make labels or adhere to anything you want to put on a magnetic surface. Attach to pictures, business cards and much more. Cuts with ease to create the specific length needed. Magnetic accessories make building and maintaining your planning board easier. Arrange data easily and quickly when changes become necessary. Print paper labels and apply to the adhesive side. Attach pictures, business cards and more. Great for all magnetic surfaces: boards, file cabinets, storage lockers and more.